Meet in Lower Manhattan’s Financial District, where you’ll meet your expert local guide to begin your Viator Exclusive tour, available nowhere else. Your morning starts off with a walking tour of Wall Street. Learn about the transformation of New York City from an early Dutch settlement to the financial capital as you pass the New York Stock Exchange, Federal Reserve Bank and other financial and historical institutions. Your Wall Street walking tour leads you to the World Trade Center site, home to the 9/11 Memorial, a monument commemorating the victims of the September 11 terrorist attacks of 2001. Walk around to see the enormous reflecting pools and fountains. Your guide will tell you stories of the events, tragedy and heroism of that infamous day. After this sobering and deeply moving experience, your guide will accompany you to the ferry. This Viator Exclusive gives you reserve line access for the ferry to Liberty Island, letting you bypass the long lines. Before sending you off, your guide will provide commentary about the Statue of Liberty, one of America’s greatest symbols of liberty and freedom. Admire views of the amazing New York City skyline as you cruise along New York Harbor. Have your camera ready as you approach Lady Liberty! Arriving at Liberty Island, pick up a handheld audio guide (available in 9 different languages) for your visit. Next, go inside this famed icon with reserved access to the Statue of Liberty’s stone pedestal, designed by famed architect Richard Morris Hunt. The top of the pedestal is roughly half the height of the entire monument, and offers panoramic views of Ellis Island, New York, New Jersey and New York Harbor. Only a limited number of visitors are permitted per day, so be the fortunate one to experience the Statue of Liberty up-close. 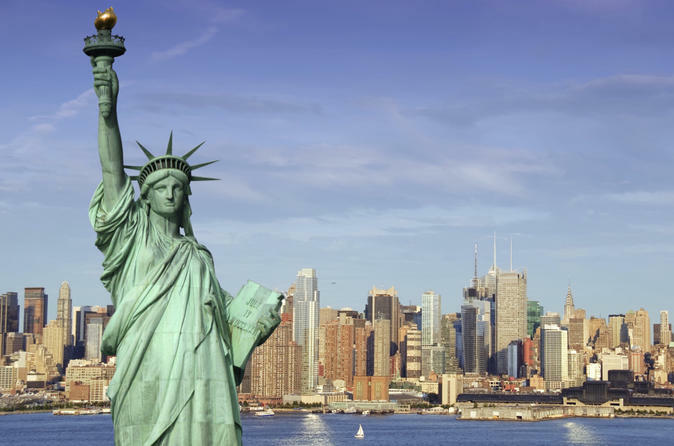 Your ticket also includes access to the Liberty Island Museum, where you’ll learn about the difficulties and triumphs that France and the US overcame to build this universal symbol of liberty and democracy. The museum also covers how the Statue of Liberty's interpretation has changed since its construction in 1886. Here, your tour concludes and you may choose to stay on the island as long as you wish. On the return ferry, choose to disembark onto Ellis Island, the gateway for 12 million immigrants. End your day with one last view of the beautiful Statue of Liberty before returning to Lower Manhattan by ferry. Please note: This tour does NOT include admission to the 9/11 Museum and Statue of Liberty Crown admission.